Are you looking for a compact SUV? The Ford Escape is a sought-after compact SUV with consumers for many reasons. 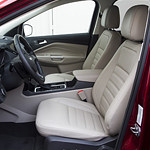 At Greiner Ford of Casper, we like to keep our customers up-to-date about our vehicles, so read more to learn about the convenience features that come with the Ford Escape. There is a standard rearview camera that comes with the Escape. This camera gives you a clear view of behind the SUV, which is displayed on the touchscreen. There is also a Reverse Sensing System that is standard on the Titanium and SEL trims. When you are in reverse, this system issues a series of beeps when an object is detected behind the Escape. The beeps will become faster as you get closer to the object. The Escape also comes with Intelligent Access with Push-Button Start. With this feature, you can unlock the vehicle with the touch of the door handle and your Intelligent Access key. To start the SUV, all you need to do is press the brake pedal and push the start button.